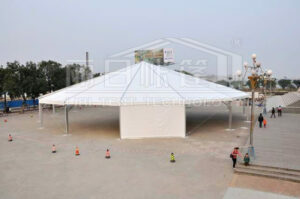 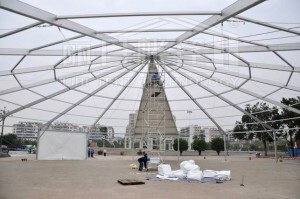 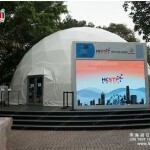 The large Hexadegonal Tent for sale is made out of hard pressed extruded aluminum 6061/T6 (13HW) structure with a profile size of 300x125x5/8mm. 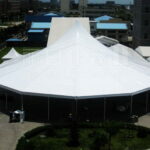 All the fabric we use consists of 850g/sqm black-out double PVC coated polyester textile. The fabric is waterproof, flame retardant to DIN4102 B1, M2, and UV resistant. 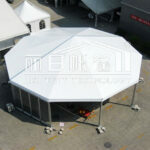 It can withstand 100km/h of wind loading, which makes it strong and durable. 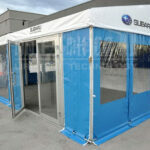 There are also many optional accessories, such as PVC transparent side windows, walls, and roof. 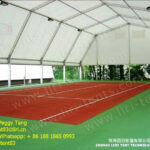 It also includes plastic walls, plastic door, ABS hard wall, ground anchor, weight plate, wood cassette flooring, lining curtains, etc.